After more than 750 players from a record 63 nations got the 2018 WSF World Masters Squash Championships underway in Virginia, USA, at the beginning of the week, the World Squash Federation event will reach the semi-finals stage today (Friday) as players do battle for places in the finals. 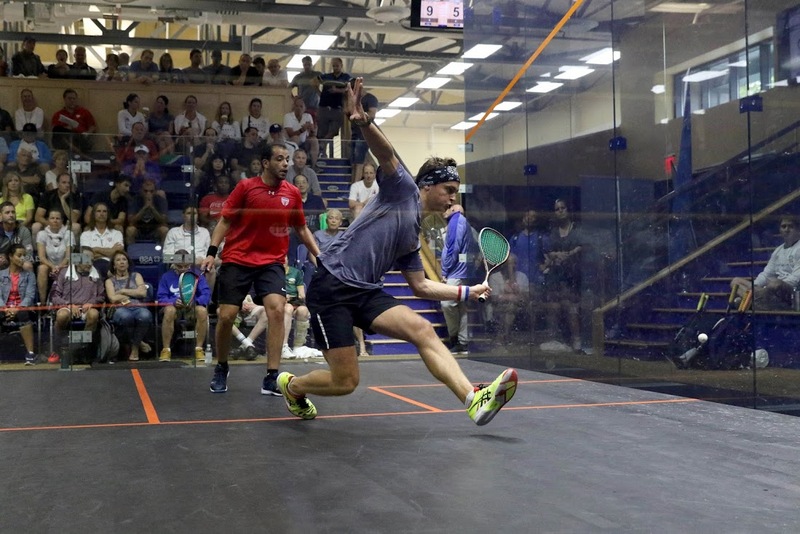 The 15th edition of the biennial championships – but the first to be held in the USA – is taking place at the McArthur Squash Center at the Boar’s Head Sports Club in Charlottesville, with 19 men’s and women’s events in categories ranging from Over-35 to Over-80. Australia leads the field with 16 semi-finalists, followed by England and South Africa with 11, hosts USA at 10 and Canada at six. There are many notable family links in various age groups, with Laurens Jan Anjema top seed in the men’s over-35 tournament and his father Robert bowing out at the quarter-final stage in the over-65s. In the men’s over-45s, Peru’s world No.11 Diego Elias has been at courtside to cheer on his father, Jose Manuel, who fell at the last-eight stage to number two seed Zuko Kubukeli, from South Africa. He now meets fellow South African Adrian Hansen in the semi-finals. In the top half of the draw, Nick Taylor faces Galen Le Cheminant, now playing for the USA, after beating England’s Tim Garner in straight games. In the over-35s, several former PSA stars are making a massive impact. Egypt-born Wael El Hindi, now representing the USA, beat Garner’s younger bother Ben, and now faces No.2 seed Alister Walker of Botswana. LJ Anjema faces No.5 seed Alejandro Garbi Caro of Spain, who overcame No.4 seed Clinton Leeuw (RSA). Most events have played out according to the seedings with three or four of the top seeds progressing to the semis. The biggest upset of the quarter-final round came in the men’s O75 event, where American Michael Gough dispatched England’s No.1 seed Adrian Wright 11-6, 11-7, 6-11, 5-11, 11-4. The 79-year-old from Atlanta won the 2014 O75 title in Hong Kong and is seeking his second World Masters title in his fourth appearance. The women’s O75 title may be decided today when South Africa’s Jean Grainger and Team USA’s Joyce Davenport face each other at 9am EDT. Both players have a 3/0 record in the six-player round robin with one match remaining on Saturday. Australia’s five-time World Open champion Sarah Fitz-Gerald comfortably moved through to her anticipated place in the Women’s O45 semi-finals. The WSF Vice-President [pictured in the gallery above at the opening ceremony with (L to R) Dent Wilkens of US Squash and Tim Rose of the University of Virginia Foundation]. Fitz, who is seeded to win the title for a third successive time, faces Karen Meakins, from Barbados, for a place in the final. The men’s O75 semi-finals will stage a perennial U.S. nationals rivalry between Jay Nelson, who holds the U.S. record of 29 masters titles, and Canadian Gerald Poulton. Nelson and Poulton have faced off eight times over the past decade, the last six of which were in U.S. National Singles finals. Poulton has won four of the past six match ups, including the 2018 U.S. 75+ final this spring. Nelson will be hoping to reach his first World Masters final in his tournament debut. The women’s O35 semi-finals field another first-time American participant in the form of Margaret Gerety. 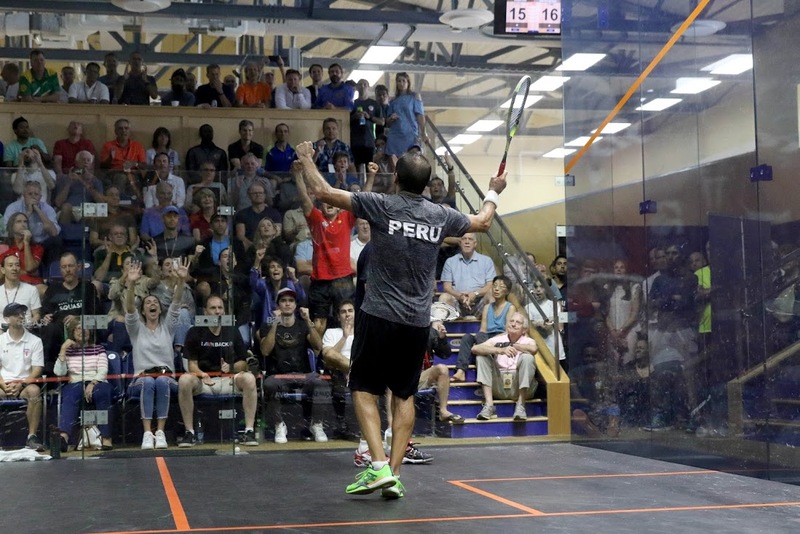 The 38-year-old heads the squash program at Squash on Fire in nearby Washington, DC. The former Harvard player upset Canada’s Leah Boody in a five-game quarter-final, and faces England’s top seed Lauren Briggs in Friday’s semis. Watch the semi-finals live and follow live scores on www.wmsquash.com/live from 9am EDT. World Masters Squash Championships, McArthur Squash Center, Boar’s Head Sports Club, Charlottesville, Virginia, USA (Quarter-Finals). Patrick Chifunda (ZAM) bt  Paul Allen (ENG) 11-9, 7-1 ret.